Posted Wednesday, August 8, 2018 by Eddy Goldberg & filed under Office Chairs, Office Furniture. We all spend a lot of time sitting. People sit all day at work, then many go home and review social media, surf the web, or play video games in the evenings. And for most of that time, they’re sitting. That’s a lot of time in a chair. If you’re sitting all the time, you might as well be comfortable. How do you get a good chair? A lot of people buy generic office chairs from their local office supply store. They generally pay about $150-$200. Then they’re back at the store again in 18 months when those chairs begin falling apart. That’s not great. You shouldn’t be replacing your chairs every 18-24 months. Buying new chairs every couple years is not a great approach. It’s much better – for your body, pocketbook and productivity — to invest in a high quality chair, especially if you sit for long periods. The Herman Miller Aeron chair is one of the highest rated office chairs on the market. 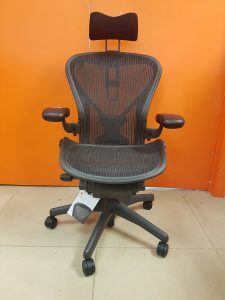 There are a lot of qualities that make the Herman Miller Aeron chair so highly-rated among customers. First and foremost is a single word: comfort. Aeron chairs are constantly praised by office workers for their comfort. Instead of traditional fabric and foam, Aeron’s mesh seating surface conforms to the sitter’s shape, evenly distributes weight to eliminate pressure points and lets air pass thru for cool comfort. Many companies prefer Aeron chairs because they have a stylish, professional look. Track provides furniture for the production sets of successful tv shows such as Suits and Designated Survivor, and their props crews like the Aeron chairs because they present a stylish backdrop to their storylines. With an Aeron chair, you needn’t worry about more stuff going into the landfill. The Herman Miller Aeron chairs are 94 percent recyclable; they are made with 53 percent recycled materials. Aeron chairs have a selection of styles and sizes. The sizes A, B and C can be used to fit people of all sizes, and the different materials – graphite, titanium and different fabrics – can meet their different tastes and budgets. Here’s an important starting point. Before you invest in a high-quality chair, try it. If it’s a chair like an Aeron chair, you will have it for a decade, and if you work at a desk, you’ll probably be sitting on it every day. Make sure it’s for you. Get into a showroom and give it a spin. There are many showrooms in the GTA where the pre-owned price is a fraction of what a new item would cost. Track can provide you with further information on Aeron chairs and how they will work for your growing organization.